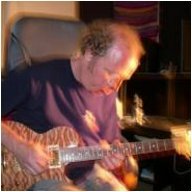 Greg Hurley is a gifted ambient guitarist and music producer currently based in San Diego, California, USA. Originally hailing from the Cleveland rock and progressive rock scene, he eventually embarked on other ventures ranging from ambient to fusion and sound design. His 1990 release Welcome! reached the New Age/AC top 40, and included a collaboration with Steve Roach. In addition to his solo music, Greg writes product magazine reviews and performs software/hardware beta testing. His nearly thirty years of electronic engineering design experience, combined with music technology development, has led to his participation in the development of new types of interactive musical interfaces such as the LightDancer and other proprietary interactive music software. Greg's approach to composition is to use layers and textures rather than just linear sequence. In particular, he uses effects on guitar and Chapman Stick to create synthesizer-like textures that have random, luscious, thick, and sometimes chaotic responses to the foundational performance. This approach leads to a more organic feel as compared to what can otherwise be considered static synthesizer composition. Greg likes to maintain chord and scale structures that evoke movement and long-form resolution, an approach more akin to classical music than contemporary songwriting structures. Earth Mantra is very proud to be bringing the music of this ambient, electronic, and rock virtuoso to our listeners, and recommend his work to anyone who loves quality music in any genre.